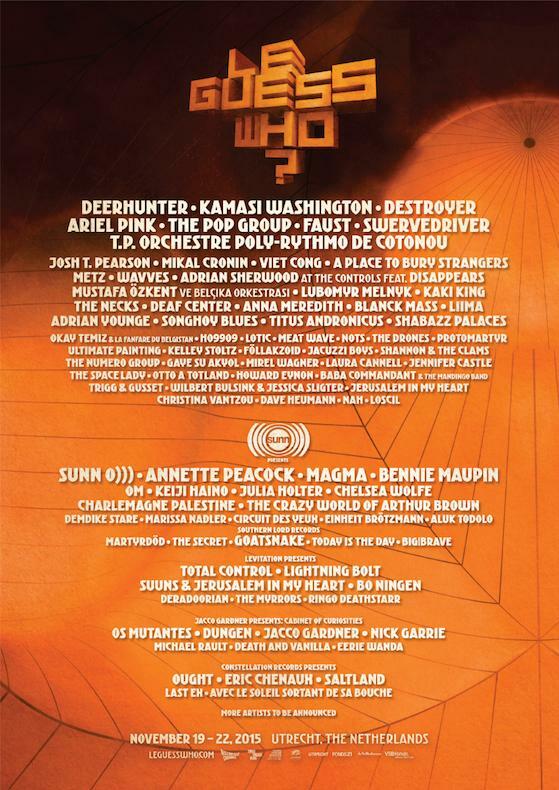 The Quietus | News | More Announced For Le Guess Who? More Announced For Le Guess Who? Le Guess Who? is fast approaching and today another load of acts have been added to the bill including a selection of names curated by Sunn O))). Sunn O))) have personally chosen a number of acts featured on this year’s line-up and now it has been announced that Keiji Haino, Bennie Maupin, Chelsea Wolfe, OM, Charlemagne Palestine, Marissa Nadler, Demdike Stare and Circuit des Yeux will join the previously announced Annette Peacock, Magma, Julia Holter and more. Southern Lord Records (founded by Sunn O)))’s Greg Anderson) will also present a selection of their own artists with Goatsnake, Martyrdöd, The Secret, Today Is The Day and Big|Brave all joining the line-up. Focusing on the festival’s main programme, there are new additions in the form of Blanck Mass, Liima, Ho99o9, Wavves, NAH, Jerusalem In My Heart, Jacuzzi Boys, Wilbert Bulsink & Jessica Sligter, Anna Meredith, Jennifer Castle and Howard Eynon. Furthermore, Montreal’s Constellation Records will be coming along with five of their acts in tow - that’s Ought, Avec le Soleil Sortant de sa Bouche, Last Ex, Eric Chenaux and Saltland. Finally, the Dutch Fluister, which is aimed at showcasing ambient and experimental electro-acoustic music will host two nights at the festival with Lubomyr Melnyk, Deaf Center, Loscil, Christina Vantzou, Otto A Totland and Trigg & Gusset all taking part in that. All of these join the previously announced Deerhunter, Destroyer, Faust and many more. Le Guess Who? takes place in Utrecht, The Netherlands from November 19-22. Day tickets for the festival are now on sale while weekend tickets are still available too. Head here to find all the necessary ticket information and to check out the full line-up.